This is a traditional British dish that was originally meant as a Monday night way to use up all of the veggies from Sunday night's roast dinner. 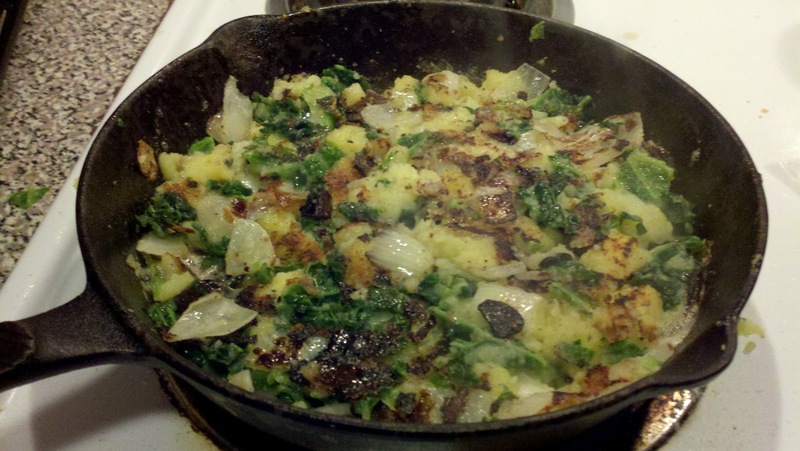 It's primarily just potatoes and cabbage, fried in a shallow pan until brown and crispy on both sides. Sometimes meat or other vegetables are added, whatever is leftover. It's really easy to make and is delish!! So, here it is. I didn't list any amounts because it all depends on how much you have leftover, or how much you like. If you like more potatoes than greens or vice versa, go for it! Oh, and it's so named because it makes a bubbling and squeaking sound while it's frying in the pan. Isn't that fun???? If you're using leftovers, just chop everything up. If you're starting from scratch, peel and boil some potatoes. Boil a few large leaves of the cabbage or other greens. Chop everything up, smash the potatoes and mix together. Add salt and pepper. Place the chopped onions in a pan with the butter and saute until they become soft. Add the potato/cabbage mixture. Press into a flat layer using a spatula. Dot with a little more butter and let it melt right in. Let it cook until it becomes nice and brown on the bottom. (This is where the bubbling and squeaking happens because of the water in the cabbage!) Now comes the tricky part. Place a plate over the saute pan. In one swift motion, invert the whole saute pan onto the plate. Now place the empty pan back onto the heat and slide the bubble and squeak off the plate back into the pan to brown on the other side. When the other side is brown, it's ready to serve! As always, when I'm starting a new dish, I do a little research to try and find the most authentic recipe. For this one, I took another look at an episode of The Two Fat Ladies, because I remembered that they made it once upon a time. Well, apparently, Clarissa has VERY strong opinions about Bubble and Squeak. First, she used boiled potatoes and then sliced (and slightly smashed them) instead of using mashed potatoes (as some people usually do). OK. And then she said that you should use some sort of greens, such as savoy cabbage or turnip greens. OK fine. But then she insisted that you should use beef drippings or LARD in the pan instead of butter or any kind of oil, and if you don't have lard then you should make something else. Really? Why is lard so important?? She also stated that you shouldn't turn it over all in one piece because "It's not an omelet." So, first, I made it Clarissa's way, and then I made it my way.. Frankly, I like mine better. Yes, I used smashed boiled potatoes and savoy cabbage, but I used butter in a nonstick pan, flipped the whole thing over at once, and it was absolutely delish! The one pictured above is Clarissa's way. Mine was much browner all over, and much prettier, I must say. Maybe next time I make it, I'll take another picture. Great then.